Click Here for our Wholesale Store Bulk Packs. 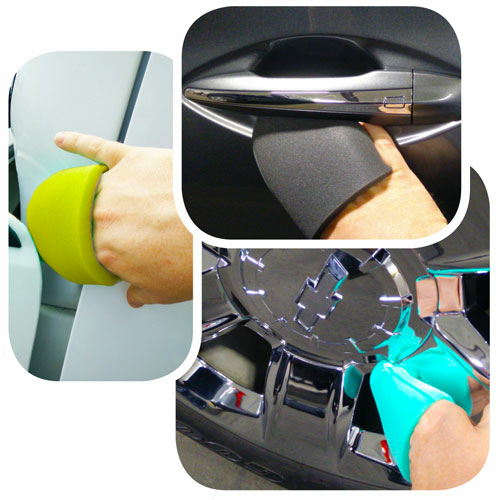 Hi-Buff Finger Mitt Applicators are perfect for those hard to reach nooks and crannies your polisher can't touch. Made of high quality foam and can be used for everything from wheel and engine cleaning to interior dressings. The multi-functional design allows for endless possibilities. Hi-Buff YELLOW Finger Mitt Applicator is the most aggressive of the three and is great for dirty jobs such as wheels and engines. It may also be used as a one-step polish applicator to remove light paint scratches. 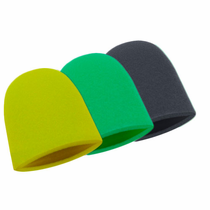 Hi-Buff GREEN Finger Mitt Applicator is slightly less aggressive than the yellow and is handy for cleaning as well as wax and dressing application. Hi-Buff BLACK Finger Mitt Applicator is ultra fine and is perfect for your final hand wax, sealant or glaze applicator. It is also a great applicator for interior dressings on plastic, vinyl and leather.